I have been known to do my best work at home. One of the main reasons for this I love cooking outside. My family were never into barbecues when I was a boy. I didn’t go to my first barbecue until I was 17, but since that day I have been hooked. I love the image of the man cooking at the barbecue in his Hawaiian shirt and novelty apron, enjoying a beer with his family gathered around. Much like Tony Soprano in my favourite TV series of all time. Another of the reasons I cook outside is because I set fire to our extractor fan one winter, much to my poor wife’s delight. I keep on saying I will replace it when I refurbish the kitchen, but I have never got around to it. So I get sent outside to cook anything that is going to create smoke! 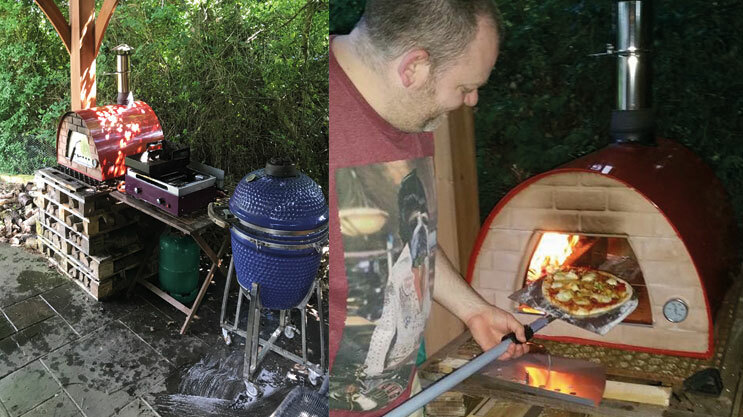 I have learnt over the years that there is so much more to cooking outside than a traditional barbecue with burgers, sausages, kebabs and chicken drumsticks. Don’t get me wrong. You can’t beat the old classics, but there are many other things you can cook outside with the right equipment. I am lucky, my wife has allowed me to keep on extending my outside cooking area. We now have a pizza oven, ceramic egg barbecue and solid top in addition to a charcoal grill. There is nothing I can’t cook outside. Bacon and egg cooked on the solid top is, as my colleague Kevin Macey would say, ‘bangin’! With a decent cover and some heating, you can cook outside at any time of year. In the winter I will sometimes roast the beef for Sunday dinner in the pizza oven or charcoal grill the chicken for my January diet. The ceramic egg is great for smoking meat and retains so much heat I can cook myself a cheeky grilled cheese sandwich at the same time! Everyone barbecues differently. I love the fact that I think my barbecue is better than Francois’ and Pete’s, and they think theirs is better than mine. Even without any of us trying each other’s and although one of them is from Texas, the spiritual home of the barbecue. I shop around, using different suppliers depending on what I need, to get the best quality products I can afford. And it’s not just about the meat; it’s the seasoning and then the accompaniments – baked potatoes, corn on the cob and char-grilled salads. And then there are the sauces; we have a whole shelf in our fridge dedicated just to sauces. Given the choice, my next additions to the outdoor cooking area will be a fridge and a sink. Maybe after I’ve sorted out the extractor fan though! If you fancy trying some of my best barbecue recipes here are a couple of my favourites.